You are here: Home / company news / Why titanium is popular in bicycle manufacturing? Why titanium is popular in bicycle manufacturing? Titanium is a silver colored and highly active light metal. Its density is 4.51g/cm3, which is only 57% of iron but three times in the term of the strength. Designs made using the properties provided by titanium often result in reliable, economic and more durable systems and components that exceed service life expectations at a lower overall cost in the long run. In recent years, titanium and its alloy has a very wide range of applications in the bicycle manufacturing, not only the frame, we can say that almost every part of the bicycle can basically have the parts made of titanium alloy material, such as titanium alloy vertical, titanium alloy horizontal and other parts, even including screws. Titanium alloy can be said to belong to the super-high-end metal materials, and the processing process is extremely complex. Compared with other metals used in bicycle frames, titanium has a higher ability to cope with road surface defects and deformation. This means that carefully designed titanium frames can better handle bumpy surface surfaces and thus provide a more comfortable driving experience. 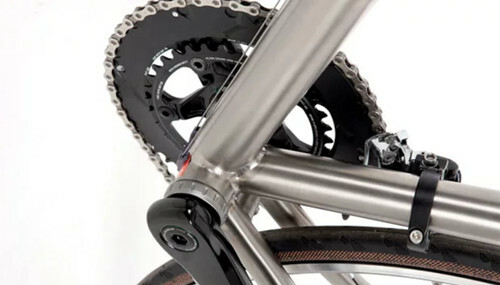 Titanium frames are usually paired with carbon forks to enhance road comfort. Road bike frames are made of titanium in different proportions from other metals (usually aluminum and vanadium), depending on the required physical properties, which improve the durability and physical properties of the pure metal. Another advantage of titanium frames is that they do not corrode like steel. So in general, titanium frames often exhibit a distinctive metallic gray sheen. Similar as aluminum, titanium pipe kits can be cold drawn and hydraulically formed, so while the titanium frame may have a circular main pipe with external cable wiring, the pipe suite may have other shapes and also allow for internal wiring. An extreme example is Lynskey’s Helix framework suite, which uses spirally twisted tubes to help resist twisting forces. As with any metal frame, the length and inclination of the frame pipe are cut before welding. Because the reactions with oxygen, welding titanium casings are more complex than making alloy frames, and it can take up to five hours of labor to complete the weld. The fitting must then be tapped to fit the parts bolted to the frame, and final finishes and markings added. Although most titanium frames are welded, there are other options. 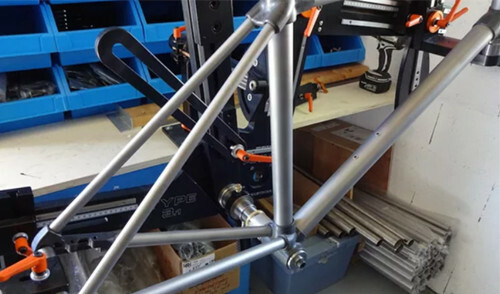 Caminade, a French maker of bespoke car frames, has just launched its Allroad frame component, which uses titanium tubes attached to carbon lugs to make it cheaper than an all-titanium welded frame. Titanium is almost ideal for bike manufacturing. It’s light, tough, comfortable, and if designed right, it gives you incredible responsiveness and propulsion. The increasing complexity of the pipe suites now available means that the stroke can be adjusted to provide the qualities needed to handle terrain types. In so many bicycle material such as steel, aluminum alloy, carbon fiber, and so on, only titanium alloy with high strength, low density, low elastic modulus, good fatigue resistance and corrosion resistance, it is much better than carbon fiber material of bicycle, carbon fiber material parts are also expensive, but have a fatal weakness is beyond repair. https://lkalloy.com/wp-content/uploads/2018/12/nidi.jpg 350 500 XALK http://lkalloy.com/wp-content/uploads/2018/10/LKALLOY-LOGO1.png XALK2018-12-17 07:07:382018-12-17 07:12:23Why titanium is popular in bicycle manufacturing?